Hina is a qualified Art of Living and Sri Sri Yoga Teacher with her purpose of actively promoting good health by teaching self-empowerment courses through the Art of Living Foundation. The Art of Living Happiness Program offers simple yet very powerful tools to attain a stress free body and mind. She has taught hundreds of people since 2009 helping them to find inner happiness and strength. 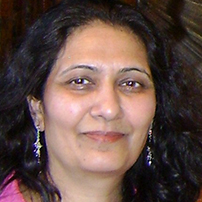 Born and raised in India and a graduate BSc in Chemistry from South Gujarat University, Hina came to UK in 1981 and settled in Aylesbury, Buckinghamshire with her family. She has a particular interest in Women Empow¬¬erment and has organised various activities/events in and around Aylesbury area. Hina has served as a Parish Councillor for one term mainly focusing on Community cohesion and harmony.